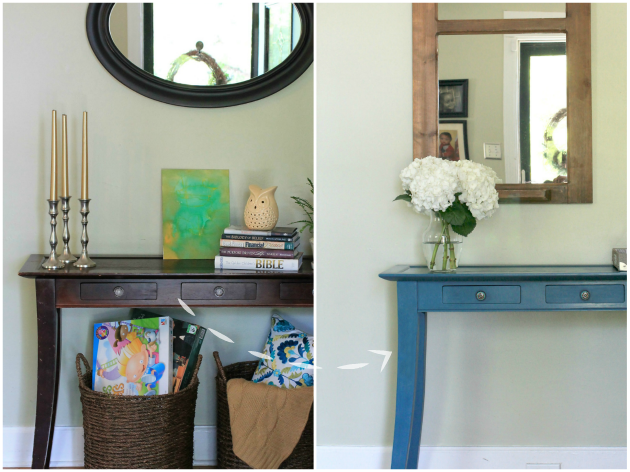 In an attempt to add some color to my living room, I decided to paint my console entryway table. I have had this same table for about 11 years and it had the dings and dents to prove it. Since I've never painted a piece of furniture I thought this was a good piece to start with. I chose to use Annie Sloan Chalk Paint. This paint is amazing and no it is not chalk board paint. The name rather comes from the velvety, matt finish. 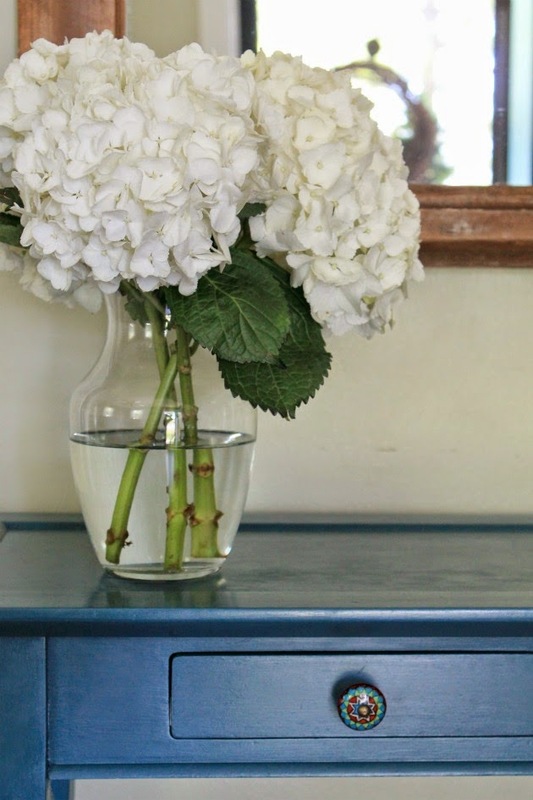 We are happy with our choice to paint the console Aubusson Blue. It adds some much needed color to the living room but yet isn't too loud. My husband wanted us to paint the console orange. You read that right, orange. I'm making baby steps over here in the color department and I didn't want to overwhelm the already calm vibe I have going on. Aubusson Blue is the best compromise. It is bright but yet deep enough to still have that calming effect for me. This paint was so easy to work with. It went on like butter! I did thin it out a bit to give me a nice and smooth finish. It covered in two thin coats. I sanded the table before hand, it is not necessary to do this step with this paint, it covers just that good. I did however cause it had a high sheen coat and I didn't want it to not cover properly. The next step was to apply a coat of soft wax. I applied one thin coat and then buffed it the next day. Maybe I don't have the wax on, wax off method down pat but I found this step a bit difficult. I was absolutely frustrated and wanted to throw the dang table out the window. My sister knows how I get when I don't like a project. Dr.Jay came to the rescue. It looks a lot better now that he took over. It still has some spots that need a little extra attention and he thinks I need to apply another coat of wax. I installed some new knobs and I like how they add a bit of playfulness. Going for a more functional entryway, I added a simple command center. 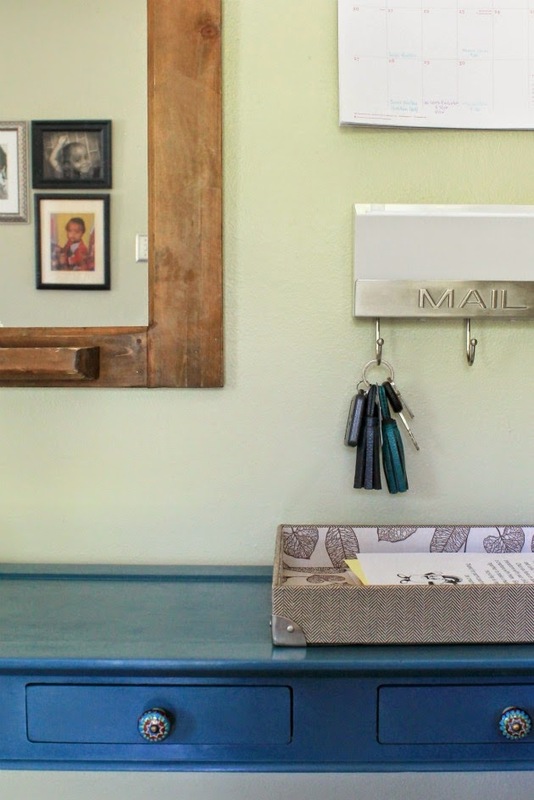 We have our family calendar, a place to hang our keys that doubles as a mail holder, a tray for notes and papers that needs immediate attention. So what do you think of my first ever furniture paint job? I am glad I chose to breath new life into my little old table. It is now a statement piece in our living room. Have you painted anything lately? 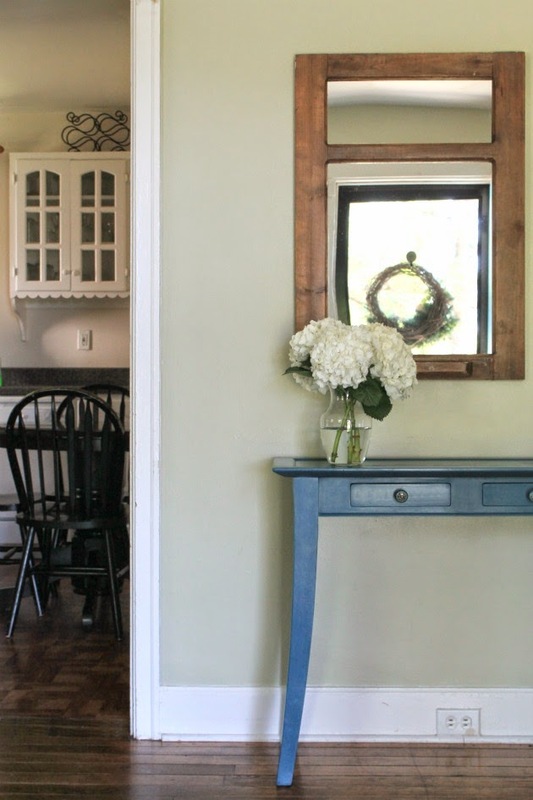 Did you use chalk paint? See ya soon! Darnetha!!! It looks beautiful. You did a fantastic job and that color is perfect. 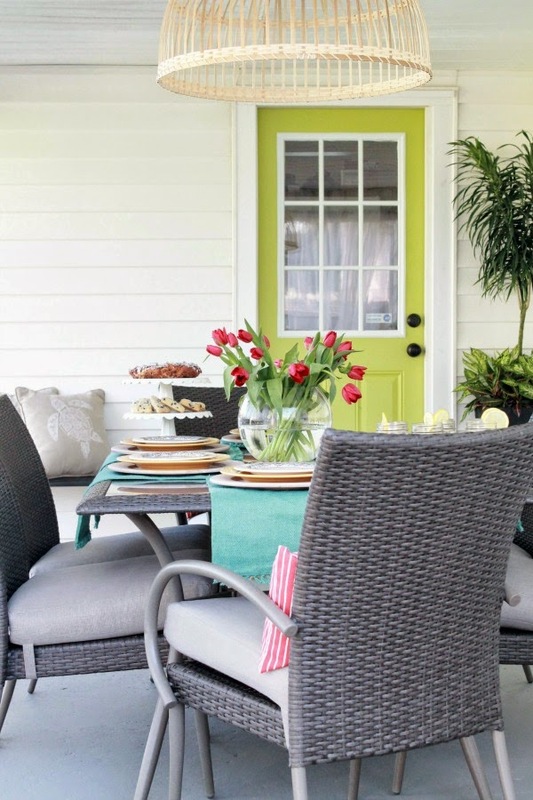 Its the perfect pop of color for your entryway. Where did you find those knobs? And what kind of wax do you use and how do you buff it off?? Lol! I am making my own chalk paint, but I want to know how to do the rest before I get started! This is so beautiful and functional!! Thank you Dawn! I got the knobs from World Market. I used the Annie Sloan soft wax. I rubbed the wax into the surface of the paint and allowed it to dry for a day. Then I can back with a clean soft cloth and buff it off in a circular motion. I put too much on, which resulted in it being sticky to the touch. So apply a thin layer of wax is my best advice. I hope this helps and feel free to email me if you have more questions. 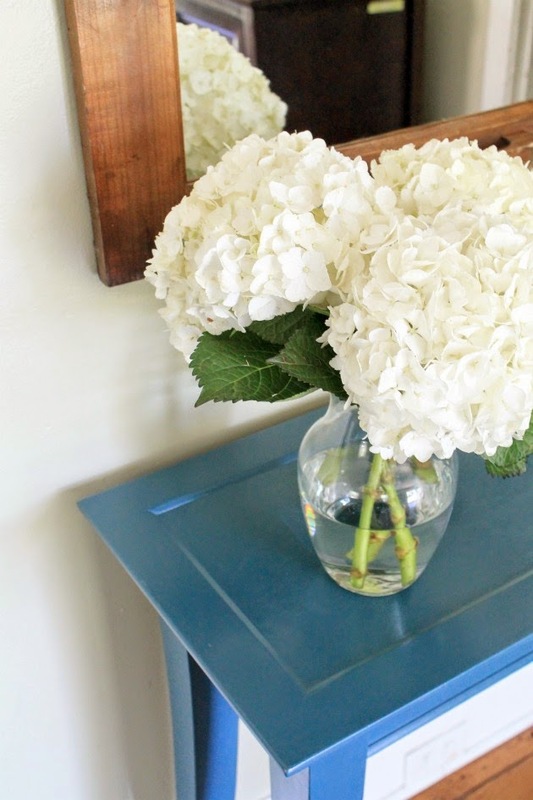 I love the new color and all the accessories you added to your entryway. Now that you've painted your first piece I bet you're looking around your house, like what else can I paint now! LOL!! I so love the blue and it turned out great!!! Gorgeous! you're right, the knobs add some playfulness to it and gives it nice character. And I love the mirror you found. Thank ya Audra! 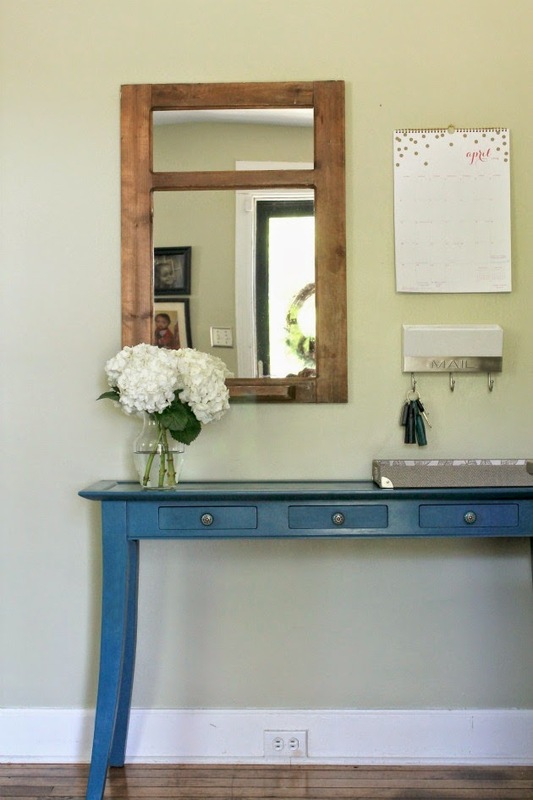 The mirror was actually a painters frame that we had an old mirror from our bathroom redo cut to fit. I wanted to make it a chalkboard cork board at first but I am so happy we went with the mirror idea. Thanks Katrina and you should give chalk paint a try. It is so user friendly and a little goes a long way. I am so glad my husband helped me out and he said it's like waxing your car. Which I have never done. Lol. Great job! I love the color and the new knobs that you chose! It turned out really pretty! Love that blue! 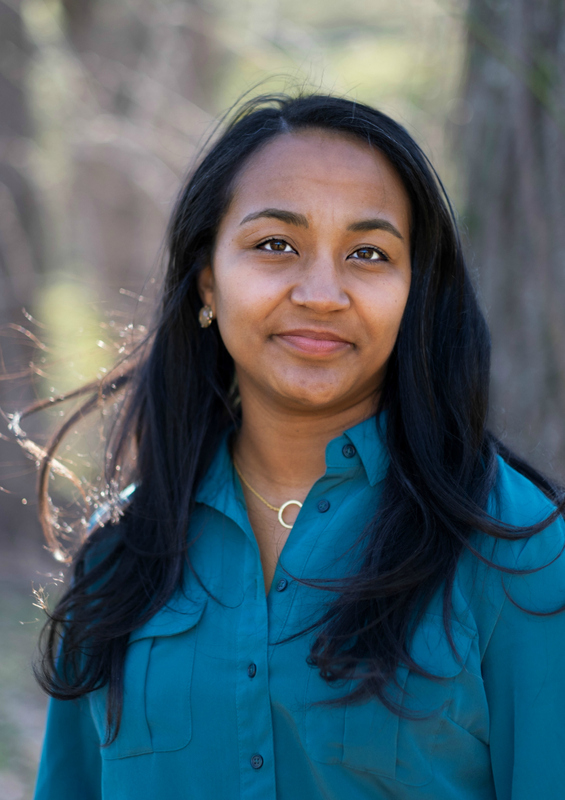 I'm also loving the new look of your blog! Yep, turn down for what! Lol!